I don’t believe that Jesus died the most horrific, terrifying and humiliating death on the cross…so that you could live a tame life! He died so you could be fierce- to live a life of courage and boldness! Take a look at 2 Timothy 1:7: For the Spirit God gave us does not make us timid, but gives us power, love and self-discipline. We can never forget that we are not our own, we have been bought at a price. Each one of us has been specifically chosen and equipped, for what God has called us to become in Him. We are called to seek His Kingdom first, and we must always keep in mind that His ways are not our ways and His thoughts are not our thoughts. I love Jesus’ heart and motives- we read in the Bible, that Jesus’ only joy and purpose is to do exactly what His Father desires Him to do. This obedience resulted in Jesus being marginalised, made fun of, despised, labelled, homeless and eventually rejected to the point of death on the cross. The problem about comfort is that living becomes about you and your desires- but more than that, it makes us drop our guard and we open the door for mediocracy to rule our lives. No one could believe for one moment that Jesus felt comfortable whilst hanging- beaten, bruised and bleeding- nailed to the cross! We are to live as Jesus did (1 John 2:6). Yes, this means stepping outside of our comfort zones, but it also means living life to the full! Romans 12:2: Do not conform to the pattern of this world, but be transformed by the renewing of your mind. Then you will be able to test and approve what God’s will is—His good, pleasing and perfect will. Throughout history, God has called His people to be unique, different, to stand out from and set an example to the nations around them. We are not aimlessly walking this earth without purpose, a hope or a future. We are not living for this world; our focus is on eternity. Jesus has called us to live counter-culturally. We are not called to float downstream, we are called to swim upstream, against the current. We are called to stand for truth, righteousness, justice, to live for others and not ourselves, to love the unlovable, to show kindness to those who hate us. We live to reflect Jesus- to be His hands and feet here on earth. One reason that we are NOT called to be conformed to this world is that, if we do conform, we become invisible. Instead, we are called to be visibly distinct- in what we think, believe, and how we act. We are not called to be invisible!- we are called to reflect and shine Jesus and His kingdom, here on earth. The culture of this day is driven by a post-modern way of thinking. In a nutshell: we are told by post-modernists that “Absolute Truth is a myth”. According to this ideology: it’s up to the individual to decide whatever they think, feel and believe to be Truth. By combining that thinking with the technology of our day, applications such as Facebook and WhatsApp, we are being conditioned to shrink back and be self-absorbed- unwilling to authentically confront, or be confronted by anyone. The “bottom line” for this generation is “Tolerance”, rather than standing up and confronting things that destroy life! As Christians, we are called to hate evil, confront sin amongst us, stand up for the Truth and persevere if we suffer as a result of our faith in God. A bitter-sweet truth about living the Christian life is that, throughout history, God has chosen the weakest, smallest and least-qualified people to live and do the most extraordinary things! Israel was the least of all the people groups, yet God chose them for His own. God chose Queen Esther, to make herself vulnerable to the death penalty, when He asked her to enter the presence of Xerxes, without being called. She, who had no reason to put her faith in her own power, was used by God to save her people from genocide. Samson was rebellious. David was over-looked. Among Jesus’ twelve disciples were uneducated fishermen and a previously corrupt and hated tax collector. The apostle Paul tried to destroy the church before God revealed the Truth to him! Paul went on to write two-thirds of the New Testament- so many life-changing God-breathed revelations are contained in these books! And yet Paul says of himself that he was: “the worst of all sinners”! One thing I have learnt from my life’s challenges and struggles is to rejoice in the Truth that our success in our God-given purpose has nothing to do with our own ability- it’s about Jesus, and His power, living within us. By His Grace, we are able to declare that “in our weakness, God’s power is made perfect!” (2 Corinthians 12:9). Don’t cop out (opt to submit defeat instead of persevering in the fight) from what God is calling you into! Yes, you may feel weak, and not worthy of the call of Jesus, but so were all the people called by God who I have just mentioned… the only possible difference between you and them is that they were obedient to what they were called to do- they didn’t cop out because they chose to believe in God’s promises! Today, choose to embrace the identity that is yours, by God’s Grace and Jesus’ sacrifice. It’s never been about your ability to save yourself, or others. Your calling has always been by God’s strength and for His Glory. God calls you, as His instrument, because He loves you enough to want to include you in His plans, in order to build a relationship with us and transform us into His image through His Love. Embrace this adventure- obey God’s command, by God’s empowering…to be fierce! Bret is married to Abby and together they serve on the leadership at Joshua Generation Church. 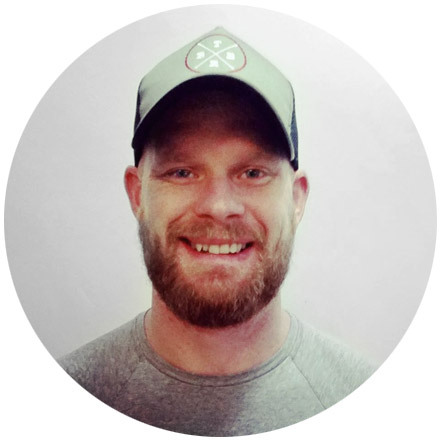 Bret is a dedicated father to their two energetic children, an avid outdoorsman, Crossfitter and foodie. Bret loves sharing the word of God and has a passion for preaching and teaching.